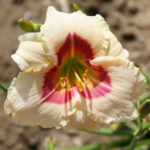 If you venture around the daylily world long enough, you will most certainly come across numerous daylilies with the word “Siloam” in their names. 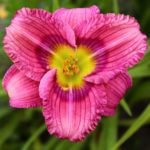 They were designated as such by their creator, Pauline Henry of Siloam Arkansas, who started registering daylilies in 1963. 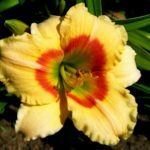 Over a 37-year span, she recorded more than 470 daylilies with the American Daylily Society, making Pauline a world-renown hybridizer. 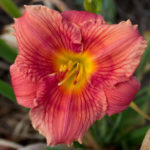 In addition to using Siloam when registering her daylilies, Pauline was known for naming many of the creations after friends, including her dentist. The winner of numerous awards, Pauline’s passion for the flower is undeniable, and her legacy in cultivating is illustrious. 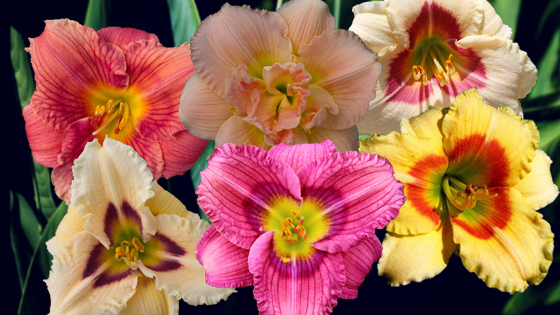 Although she passed away in 2000, at the age of 92, Pauline’s cultivars found in gardens, far and wide, will forever be a reminder of those who devote their lives to daylilies. 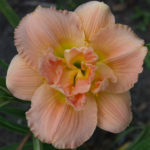 Almost 20 years after Pauline registered her first daylilies, the Siloam Ethel Smith was recorded in 1981. This award-winning beauty is a pinkish beige with a deep rose eyezone and green throat. It is ruffled and recurved. Honorable Mention 1984. Flower diameter is 3”. Here is another award winner, the Siloam Gumdrop, which was registered in 1983. It is a pale pink with a red eyezone and green throat. It is fragrant, ruffled and recurved. Honorable Mention 1993. Flower diameter is 3”. 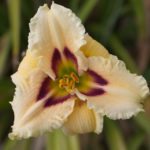 The Siloam Double Classic, registered in 1985, is one of the better known Pauline Henry’s daylilies. It has won four awards: Junior Citation 1985, Ida Munson Award 1988, Award of Merit 1991, and Stout Silver Medal 1993. The flower is a bright pink self with a yellow-green throat. It is a diamond dusted double that boasts extended blooms and is heavily ruffled and recurved. Flower diameter is 5”. With its dainty 3” flower diameter this fragrant charmer will brighten any garden. It is rose with a red eyezone and green throat. Siloam Flower Girl was registered in 1980 and is an extended bloomer that is lightly recurved. The Siloam New Toy is a delicate extended bloomer that is orchid with a purple eyezone and green throat. It has a flower diameter of 3.5” and is fragrant, ruffled and recurved. It was registered in 1986. Registered in 1980, the Siloam Ury Winniford is a multiple award-winning extended bloomer. It is a deep cream color with a larger purple eyezone and green throat. The bloom is ruffled, recurved and has a flower diameter of 3”. Junior Citation 1980, Honorable Mention 1984. Thanks to Pauline Henry and her passion for daylilies, devoted growers and hybridizers around the globe are able to continue cultivating and enjoying her life’s work. Thank you for giving us her history, that is so Beautiful!